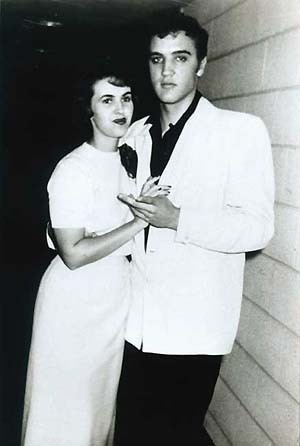 Wanda Jackson with Elvis Presley. Rock and roll and rockabilly singing star, Wanda Jackson with Elvis Presley in the '50s. . Wallpaper and background images in the Rock'n'Roll Remembered club tagged: wanda jackson elvis presley 50s music rock'n'roll 1950s singer photo. This Rock'n'Roll Remembered photo might contain well dressed person, suit, pants suit, pantsuit, business suit, and bathrobe.